Cerebral small vessel disease (CSVD) is a very common neurological disease in older people. It causes stroke and dementia, mood disturbance and gait problems. Since it is difficult to visualise CSVD pathologies in vivo, the diagnosis of CSVD has relied on imaging findings including white matter hyperintensities, lacunar ischaemic stroke, lacunes, microbleeds, visible perivascular spaces and many haemorrhagic strokes. However, variations in the use of definition and terms of these features have probably caused confusion and difficulties in interpreting results of previous studies. A standardised use of terms should be encouraged in CSVD research. These CSVD features have long been regarded as different lesions, but emerging evidence has indicated that they might share some common intrinsic microvascular pathologies and therefore, owing to its diffuse nature, CSVD should be regarded as a ‘whole-brain disease’. Single antiplatelet (for acute lacunar ischaemic stroke) and management of traditional risk factors still remain the most important therapeutic and preventive approach, due to limited understanding of pathophysiology in CSVD. Increasing evidence suggests that new studies should consider drugs that target endothelium and blood–brain barrier to prevent and treat CSVD. Epidemiology of CSVD might differ in Asian compared with Western populations (where most results and guidelines about CSVD and stroke originate), but more community-based data and clear stratification of stroke types are required to address this. 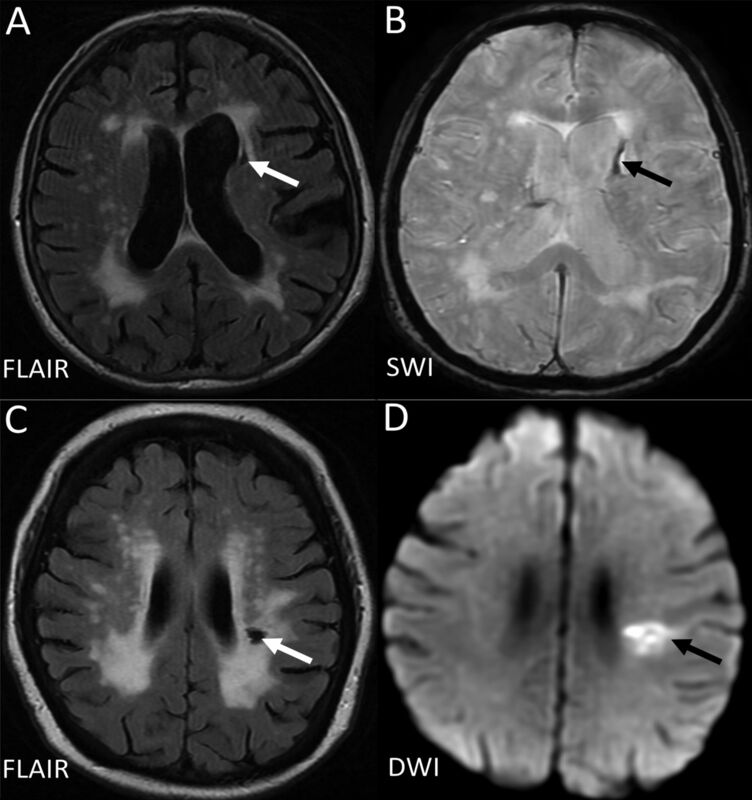 Generally, including in this review, CSVD is used to describe a series of imaging changes in the white matter and subcortical grey matter, including recent small subcortical infarct, lacunes, white matter hyperintensities (WMHs), prominent perivascular spaces (PVS), cerebral microbleeds (CMBs) and atrophy.4 Usually, recent small subcortical infarcts cause acute stroke symptoms, whereas other CSVD lesions are clinically more insidious and thus referred to as ‘silent’ lesions. However, the definitions and terms of these lesions have varied greatly among studies. 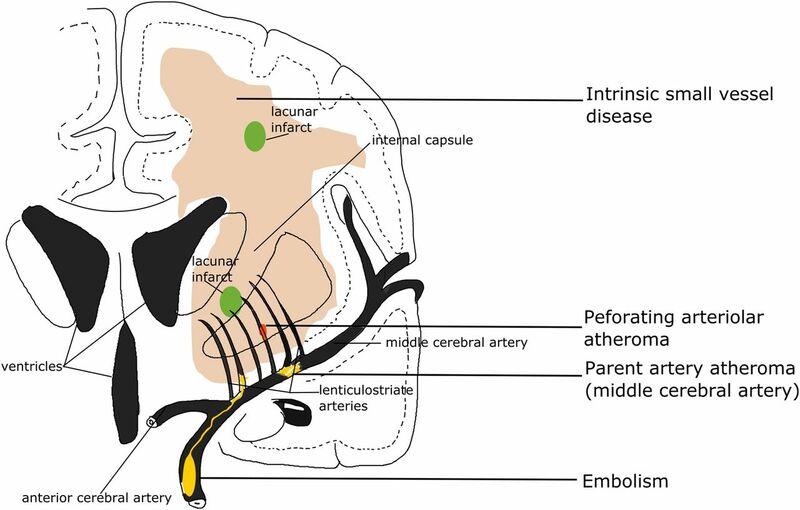 For example, a recent review identified 159 different names for recent small subcortical infarcts, but these names like ‘lacunar infarct’ were also frequently used to describe lacunes4 ,5 that were not necessarily related to symptoms and might have been due to haemorrhage. The substantial variation in the use of these terms has probably contributed to confusion and difficulties in interpreting previous research. Therefore, in 2013, an expert workgroup on CSVD proposed a list of standard terms to help avoid confusion and suggests that CSVD researchers should be encouraged to apply these terms in future studies.4 We will also use these terms in this review. The different features of CSVD have long been regarded as different types of tissue changes. However, recent studies show that these features are correlated, are more likely to share common diffuse intrinsic small vessel pathologies, and are probably also more ‘dynamic’ than previously thought. Advances in imaging techniques have brought new insights into mechanisms of CSVD. In this review, we will summarise findings in recent clinical studies on CSVD, discuss CSVD mechanisms and explore emerging prevention and treatment options. A lacunar clinical syndrome could be due to either ischaemia or a small haemorrhage.6 Many haemorrhagic strokes in older people are also due to CSVD pathology.1 In this review, we will focus mainly on ischaemic CSVD. Lacunar ischaemic stroke is defined as a stroke that is attributable to a recent small infarct <1.5 (or some say 2) cm diameter in the white matter, basal ganglia, pons or brainstem, and is consistent with a lacunar clinical syndrome.7 It is commonly attributed to an abnormality in a single small deep perforating (or lenticulostriate) artery. 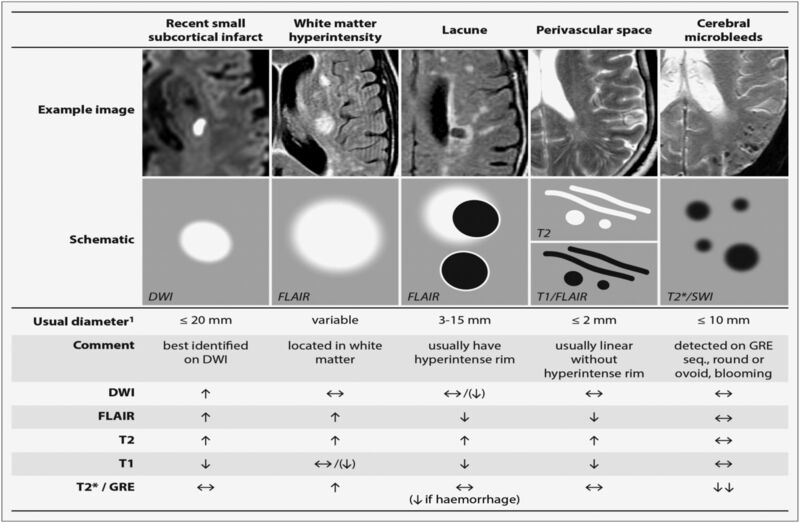 On MRI, an acute lacunar infarct is shown as hyperintense on diffusion-weighted imaging (DWI), hypointense on an apparent diffusion coefficient map, hyperintense on T2-weighted and fluid-attenuated inversion recovery (FLAIR), hypointense on T1 and hypoattenuated on CT (figure 1). It can be rounded, ovoid or tubular.4 Generally, the Oxfordshire Community Stroke Project (OCSP) classification, which uses only clinical features to diagnose the stroke subtype, can predict correctly the size and location of a recent brain infarct on imaging in 75–80% of patients with stroke.8 However, up to 20% of acute lacunar infarcts can present with cortical symptoms, and conversely cortical infarcts can present with lacunar syndromes.9 One explanation is that lacunar infarcts closer to the cortex are more likely to cause cortical symptoms.9 Therefore, in studies where stroke diagnosis relied mainly on the clinical presentations, this ‘mismatch’ may have added ‘noise’. Thus, in epidemiology, mechanistic studies or clinical trials, it is important to verify stroke lesions using sensitive imaging wherever possible. STRIVE, STandards for Reporting and Imaging of Small Vessel Disease: example findings (upper), schematic representation (middle) and a summary of imaging characteristics (lower) of MRI features for changes related to small vessel disease.4 DWI, diffusion-weighted imaging; FLAIR, fluid-attenuated inversion recovery; SWI, susceptibility-weighted imaging; GRE, gradient-recalled echo. In some clinical stroke classifications such as the Trial of Org 10172 in Acute Stroke Treatment (TOAST) or the ASCO (A: atherosclerosis; S: small-vessel disease; C: cardiac pathology; O: other causes), another term ‘small vessel/artery disease’ rather than ‘lacunar stroke’ is used to represent a stroke that is supposed to be due to a small artery occlusion. However, these classifications use risk factors to decide the stroke subtype, not just the clinical presentation, so as to distinguish ‘small vessel/artery disease’ from strokes caused by large artery atherosclerosis, cardiac emboli or other unknown reasons. However, a small embolus, or atheroma in the middle cerebral artery (MCA) or perforating arterioles can all block the perforating arteriole, and any of these can cause a lacunar ischaemic stroke (see figure 2). Therefore, it might be better to focus on the clinical presentation to assign the stroke syndrome and separately focus on the risk factors for patient management. Four possible mechanisms that cause a lacunar infarct (from bottom to top): (A) an embolus from the big arteries or cardiac sources goes up to MCA and ends up entering and occluding lenticulostriate arteries, resulting in a lacunar lesion in basal ganglia; (B) if the atheroma in the parent artery (ie, MCA) is positioned at the opening of its penetrating branches, it could lead to an acute occlusion of one or several penetrating arteries, hence causing a lacunar infarct; (C) a lacunar infarct could also be due to atheroma in the perforating artery if an acute occlusion happens; (D) intrinsic small vessel disease may lead to diffused disrupted blood–brain barrier. If this happens at an arteriolar level, plasma fluid components would enter and deposit in the vessel wall, resulting in narrowing of the arteriolar lumen, vessel wall thickening and eventually a secondary luminal occlusion and traditional infarct. MCA, middle cerebral arteries. Intrinsic small vessel pathologies remain the most common cause of lacunar ischaemic stroke, although the underlying mechanism is unclear. Fisher attributed the lipohyalinosis in small arteries to hypertension. However, the diagnosis and treatment of hypertension were less good when Fisher was working in the 1950s and 1960s and he may have seen some particularly severe cases of hypertension. Now, epidemiology data show that hypertension is equally common in non-lacunar as in lacunar ischaemic stroke;19 and many patients with lacunar stroke are normotensive. Similarly, other traditional risk factors like diabetes mellitus, hypercholesterolaemia and smoking were as frequent in lacunar stroke as in other ischaemic strokes.24 Risk factor profiles of lacunar stroke seemed different in China, but it might be too early to say so. The Beijing stroke registry (n=1184) showed a higher proportion of hypertension in lacunar (acute stroke symptoms+subcortical lesion <2 cm diameter on acute CT/MRI) than in non-lacunar stroke after adjusting for age and gender.3 Some other studies had similar findings, but the stroke diagnosis varied: in some studies, the differentiation between lacunar stroke and ‘large artery atherosclerosis’ stroke relied only on lesion size, and clinical classification included risk factors.25 ,26 Additionally, most studies were hospital-based. Hence, population scale data on lacunar stroke are lacking. It is important to distinguish lacunar stroke from other subtypes because of the mechanism, hence prevention and treatment might differ. More data and careful separation of lacunar stroke from other subtypes are required in future studies. WMHs are usually symmetrically and bilaterally distributed in the white matter including the pons and brain stem, and also occur in deep grey matter. They appear hyperintense to the normal brain on T2 or FLAIR MRI (figure 1), and can be patchy or confluent depending on their stage in development and severity. Multiple mechanisms underlying WMH such as incomplete infarct, chronic hypoperfusion and venous collagenous have been proposed, but evidence for each is limited. In a pathology study (n=15), no incomplete infarct was found in WMH.29 Though many cross-sectional studies have found low cerebral blood flow (CBF) to be associated with higher WMH burden, the causality between low CBF and WMH is unclear.35 A longitudinal study (n=575) showed that more severe baseline WMH predated CBF decline over time rather than falling CBF predating WMH progression.36 In a postmortem study, some non-inflammatory, periventricular venulopathy was observed in periventricular WMH, suggesting that venous collagenosis might cause tissue damage by vasogenic oedema and impede ISF circulation.31 However, this theory remains to be confirmed in in vivo studies. Impaired BBB was noted in WMH areas in autopsies,29 ,30 which was corroborated by studies using cerebrospinal fluid (CSF)/plasma albumin ratio37 and MRI.38–41 It is hypothesised that the disrupted BBB would result in leakage of fluid, plasma components and cells and eventually lead to perivascular inflammation, demyelination and gliosis. Indeed, the formation of WMH is likely to be multifactorial. Hypoperfusion, venous pathologies and BBB impairment might all play critical roles in WMH initiation or progression and interact with each other, but which one is the key initial factor remains unknown. The term ‘lacune’ was used by Fisher to describe a small fluid cavity in the brain which he thought was a healed lacunar infarct. Therefore, in CSVD research, it is very common that terms like ‘lacunar infarction’, ‘lacunar stroke’ and ‘silent brain infarct’ were used to refer to the CSF-filled cavities on brain MRI or autopsy.42 In fact, lacunes are not always ‘ischaemic’. They can also be the residual lesion of a small haemorrhage43 (figure 3). Also, it is common that many non-cavitated lacunar ischaemic strokes were not counted as ‘lacunar infarcts’. Therefore, in order to avoid more confusion, the term ‘lacune of presumed vascular origin’ was proposed to replace ‘lacune’ and the term ‘lacunar infarct’ should NOT be used to describe ‘lacunes’ any more. Example of MRIs of a lacune from a haemorrhagic source (A,B), and from a lacunar infarct (C, D). D (the DWI) is from the acute presentation (i.e. within a few days of the stroke), and C (the FlAIR) is weeks to months later when the lesion has cavitated. DWI, diffusion-weighted imaging; FLAIR, fluid-attenuated inversion recovery; SWI, susceptibility-weighted imaging. Lacunes of presumed vascular origin are round or ovoid, subcortical, fluid-filled cavities with a diameter of 3–15 mm. These can occur without any prior symptoms, but can also result from a previous acute small subcortical infarct or haemorrhage4 (figure 1). PVS could also mimic lacunes when they are more than 3 mm in diameter.44 Large PVS might have also been miscounted as lacunes in many studies.42 Lacunes usually present as a hypointense ‘hole’ on FLAIR surrounded by a hyperintense rim which can help its differentiation from PVS. However, the rim can be absent in some cases and PVS within extensive WMH areas may appear as if surrounded by hyperintensities, so the insistence on a rim to differentiate lacunes from PVS is not helpful in practice. Nonetheless, it is important to distinguish between lacunes and PVS if possible, on size at least, because they represent different pathologies as well as differ in clinical associations and implications. Although many lacunes might have lacked acute symptoms, when present in larger numbers they are associated with dementia, cognitive impairment, gait disturbance and increased risk of stroke.5 ,45 ,46 In the general elderly population, the prevalence of lacunes ranges from 8% to 28% (mean age=50–75 years).5 A systematic review suggests that silent brain infarcts (another term sometimes used for lacune) are more prevalent in the Asian than in the non-Asian population.47 However, it is noteworthy that most of these Asian studies were hospital-based, whereas all non-Asian studies were community-based; therefore, more relevant comparisons are needed to determine if the prevalence of lacunes and other CSVD features does differ between world regions and ethnic groups. PVS are the extension of subarachnoid spaces that surround cerebral microvessels.48 They are fluid-filled spaces that follow the course of a vessel through the brain parenchyma.48 PVS are usually microscopic and not detected on CT or conventional MRIs. When enlarged, PVS are commonly seen as hyperintense on T2 MRI, either punctuate with a diameter <3 mm if imaged perpendicular to the course of the vessel, or linear if imaged parallel to the course of the vessel49 (figure 1). PVS are most frequent in the inferior parts of the basal ganglia and centrum semiovale but can also occur in the brainstem. Though 3 mm has generally been considered as the cut-off diameter for distinguishing PVS from lacunes,44 occasional PVS could be larger and even cause a mass effect.4 PVS usually do not have a hyperintense rim on T2-weighted or FLAIR unless passing through a WMH area, which can help the discrimination between PVS and lacunes. CMBs are regarded as small round and homogeneous foci of hypointensity on T2-weighted (gradient echo) MRI and susceptibility-weighted imaging (figure 1). In the very few studies of radiological–pathological correlation, perivascular hemosiderin-laden macrophages were found to underlie most of the CMBs shown on MRI. Other possible pathologies include old haematomas, intact erythrocytes and, very rarely, vascular pseudocalcification, microaneurysm and distended dissected vessels.61 Lipofibrohyalinosis and amyloid angiopathy are the most common vascular findings in relation to CMB. These two vasculopathies are thought to have different patterns of CMB distribution: CMBs in the basal ganglia, thalamus, brainstem and cerebellum are typically attributed to lipofibrohyalinosis, whereas amyloid angiopathy is more associated with lobar CMBs.62 However, some studies suggest that there may be more overlap and larger studies are awaited to confirm the specificity of CMB distribution for particular pathologies. Most CMBs are asymptomatic; they can be found in healthy adults but are more often a marker of vascular risk factor exposure or amyloid deposition.63 In addition to its potential association with stroke, CMBs also contribute to cognitive impairment and dementia, and to transient neurological deficits.64 The prevalence of CMBs detected in community-dwelling participants in the Rotterdam Scan study (n=3979, mean age=60.3 years) and AGES-Reykjavik study (n=1962, mean age=76 years) was 11.1–15.3%65 ,66 and increased with age.66 In patients with ischaemic stroke and non-traumatic intracerebral haemorrhage, the prevalence of CMBs could be as high as 33.5–67.5%.63 It seems that CMBs may be more common in the Asian than in the non-Asian population. However, the differences might be due to a higher proportion of hypertensive patients recruited in these Asian studies or more hospital-based than community studies. It is unclear whether CMBs increase the risk of haemorrhage in patients receiving antiplatelet or anticoagulant or thrombolytic therapy and further discussion is outside the ischaemic focus of this review. We refer the reader to recent reviews on this topic63 ,67 and note that randomised trials are needed to answer these questions. Why do some CSVD lesions cause stroke while others are ‘silent’? One explanation is the locations of lesions. A study using probability mapping shows that lesions presenting with stroke were predominantly located in or near the primary motor and sensory tracts, whereas silent lesions were mostly in the basal ganglia and centrum semiovale away from these main tracts.77 Another explanation could be the levels of vessels where the vascular pathologies happened. In general, disrupted BBB would enable plasma fluid components and blood cells to enter the vessel wall, leading to disintegration of the vessel wall and fibrin deposition. If this happens at arterioles where there is smooth muscle, the components deposited in the arteriolar wall could result in dilation and narrowing of the vessel lumen and vessel wall thickening, which would eventually precipitate inflammation, platelet adhesion, luminal occlusion and thus traditional infarct. However, at the capillary level where there is no smooth muscle between the epithelium and brain tissue, the leaky BBB would cause direct damage in the tissue, such as oedema and demyelination in white matter tracts. Further studies to assess changes over time in lesion development and symptoms are required to find out the reasons. There is increasing evidence showing that CSVD is more dynamic than originally thought. Lesions progress over time and the long-term outcome and impact on brain damage vary. Cavitation is not the only fate of acute lacunar ischaemic stroke.78 An acute lacunar ischaemic stroke can also disappear or resemble a WMH (figure 4). In a prospective study (n=90), definite cavitation (ie, that looked like a lacune) was only present in 20% of patients, and was marginally associated with increasing time from stroke onset to follow-up scans. A large proportion of lacunar lesions remained looking like WMH. Thus, only calculating cavitated lacunes could lead to a large underestimation of lacunar ischaemic stroke burden. Similarly, WMH burden is likely to be overestimated without previous scans of index stroke lesions. Long-term appearances of lacunar infarcts (arrows: old stroke lesion on the follow-up scans). DWI, diffusion-weighted imaging; FLAIR, fluid-attenuated inversion recovery; WMH, white matter hyperintensity. Prevention and treatment of CSVD in the future should consider targeting the BBB, brain endothelium and microvascular function. There are multiple potential endothelial targets, such as the nitric oxide/cyclic guanylate monophosphate (cGMP) system and prostacyclin/cyclic AMP (cAMP) system.90 Therefore, interventions that could induce cAMP or cGMP or reduce their degradation appear promising. There are several licensed drugs that have these properties like some nitric oxide donors and phosphodiesterases-5 inhibitors,90 while others are still in development. More experimental studies should be encouraged. However, in the meantime, management of these traditional risk factors according to guidelines should still be encouraged except to avoid long-term dual antiplatelet drugs. In conclusion, CSVD is not just a collection of individual brain lesions, but is both a ‘dynamic’ and ‘whole-brain’ disease. All CSVD subtypes might share some common intrinsic CSVD aetiologies. Some pathological changes at the early stage of the disease could be reversible, but will gradually worsen and become irreversible as the damage in vessels and tissues accumulates. Modification of traditional risk factors and a healthy lifestyle are currently the most important prophylactic and therapeutic approaches for CSVD indefinitely and until more specific treatments are available. Apart from the trials of cilostazol which have mostly been conducted in China or Japan, in general, large clinical trials of CSVD treatments targeting the Asian population are lacking, especially in lacunar stroke. Community-based studies of CSVD prevalence and progression are also needed to determine if prevalence genuinely differs in different world regions or ethnic groups. Future studies in CSVDs should stratify by stroke subtype and by MRI diagnosis and measure risk factors carefully. Clinical trials and experimental studies targeting endothelium and BBB integrity should be pursued.
. Lacunar syndrome due to intracerebral hemorrhage. Stroke 1985;16:454–9.
. How well does the Oxfordshire community stroke project classification predict the site and size of the infarct on brain imaging? J Neurol Neurosurg Psychiatr 2000;68:558–62.
. Two types of lacunar infarcts: further arguments from a study on prognosis. Stroke 2002;33:2072–6.
. Are hypertension or cardiac embolism likely causes of lacunar infarction? Stroke 1990;21:375–81.
. Emboli enter penetrating arteries of monkey brain in relation to their size. Stroke 1995;26:1247–50; discussion 1250–1.
. Neuropathological changes late in cerebral edema: the relationship to trauma, hypertensive disease and Binswanger's encephalopathy. J Neuropathol Exp Neurol 1963;22:500–11.
. Residual lesions on computed tomography after intracerebral hemorrhage. Stroke 1991;22:1530–3.
. Large Virchow-Robin spaces: MR-clinical correlation. AJNR Am J Neuroradiol 1989;10:929–36.
. Cerebral microbleeds: a new dilemma in stroke medicine. JRSM Cardiovasc Dis 2012;1:22.
. Progression of cerebral white matter lesions: 6-year results of the Austrian Stroke Prevention Study. Lancet 2003;361:2046–8.
. Longitudinal study of blood pressure and white matter hyperintensities: the EVA MRI Cohort. Neurology 2001;56:921–6. Contributors This paper is based on a lecture given by JMW at the Chinese Stroke Association Inaugural Conference in 2015, Beijing. YS drafted the review which was then amended and approved by JMW. Funding YS is supported by the China Scholarships Council. The work described in this paper was supported by the Wellcome Trust (WT088134/Z/09/A), the MRC, the Scottish Chief Scientist Office (CZB/4/281), Chest Heart Stroke Scotland, the UK HTA, etc.